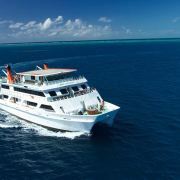 Reef Encounter is a 35 metre luxury catamaran that can comfortably accommodate up to 42 passengers. A winner in the Tourism Tropical North Queensland Awards for ‘Unique Accommodation', Reef Encounter has 21 spacious double or twin share state-room cabins. All rooms are air-conditioned and have uninterrupted ocean views with en-suite facilities. There are large lounge and dining areas, a fully licensed bar and a TV, DVD and games area. 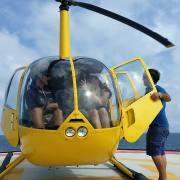 Outside there is ample deck space, a huge sundeck & loungers, an open air hot tub and a helipad on the roof for those who wish to arrive in style. 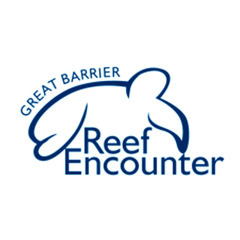 Designed for the utmost stability and comfort at sea, Reef Encounter has the exclusive commercial license to access 4 of the 5 reefs it visits.